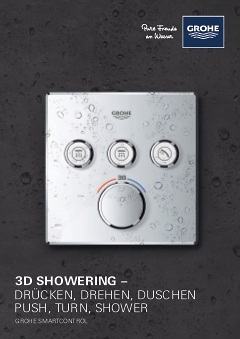 GROHE SmartControl: select spray pattern, adjust volume and save shower settings at the push/turn of a button. This innovative technology was developed to provide perfect ease of operation: push the button to start the shower, turn to adjust the water volume, and push again to pause or stop the shower. Your selected water volume is thus preset when you restart. To use hand and head shower simultaneously, simply activate both buttons. Even switching and combining spray patterns is effected at the push of a button. Always keep your shower gel and shampoo handy with the GROHE EasyReach tray. The flat tray surface is designed to match your tap for a great look and quick easy cleaning. The GROHE Rain spray has been refined into the GROHE PureRain spray, enveloping you in even bigger, softer water droplets. With the GROHE EasyClean system, the spray plate can be detached from the head shower and cleaned in the blink of an eye. Simply rinse off and it will look like new.